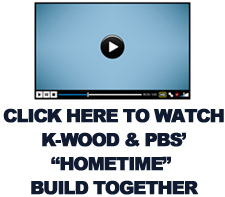 K-Wood sells the complete line of Simpson Metal Connectors and stocks a large number of commonly used metal connectors. Simpson Strong-Tie® provides exceptional products, full-service engineering and field support, product testing and training. Simpson Strong-Tie works closely with industry professionals to provide code-listed, field-tested products, and value-engineered solutions. Simpson Strong-Tie products are known for their consistent quality and availability. Lateral Bracing and Truss Spacer: An economical alternative to Standard 2×4 bracing and designed for use as PERMANENT LATERAL BRACING. Also works great for truss spacing during construction when used according to installation guidelines provided. The Stabilizer truss brace and spacer provide truss installers with the best of both worlds; that is, accurate 24″ o.c. truss spacing with ample structural properties for both construction bracing and permanent lateral bracing. 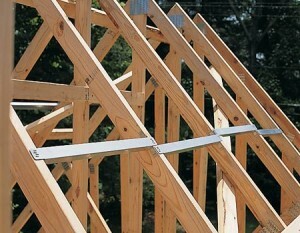 It is the first truss spacer to provide both temporary construction bracing, as well as permanent lateral bracing. The Stabilizer is truly a breakthrough product. Its unique design means truss setting will never be faster, or easier. Just attach the Stabilizer to the top chord of an installed truss, bring up the next truss, and hammer down the top and side tabs. It is simple, requiring neither nails, nor cutting and handling spacer blocks or “layout sticks.” Imagine not having to fumble for nails while hanging 30 feet in the air. And, since the Stablizer is in-plane, you just deck right over the top of it. In addition, the unique structural quality of the Stabilizer allows it to be used as permanent lateral bracing. The Stabilizer is so quick to install, you can brace webs as you set trusses, eliminating the need to return later to install lateral bracing. The Stabilizer truss brace also provides temporary construction bracing in the roof and ceiling planes, as well as permanent lateral bracing for webs as specified by your truss engineering. The Stabilizer is easily installed by embedding the patented MII 20 teeth on the top flap, straight into the edge of the truss member to be braced with a framing hammer. The side tabs are then secured by driving the teeth into the face of the truss member being braced. Use the Stabilizer for standard 24″ o.c.spacing. For odd spacing, cut and insert a solid block between the trusses. Typically, the Stabilizer is installed at 6′-8′ centers along the roof plane and 10′- 15′ along the ceiling plane. Refer to engineering specification HIB-91, or DSB-89 (published by The Truss Plate Institute) or MiTek 20/20 “Perfect Vision Software”® design software for specific bracing requirement. The Stabilizer® must be supplemented with diagonal bracing in the roof and ceiling planes and cross bracing in the web plane at required intervals.